Will you come to Institute? It’s Thursday night you know. It’s held in members’ homes – from near and far we go. The business all completed, it’s time for Golden Thread. On how we met our husbands, or silly things we’ve done. Mistakes we find most harassing, and cures for moods of blue. It fills us with elation – we try for hours and hours! Or a Labour Conference Delegate to talk of I.L.O. To go to Institutions for Christmas and for treats. Our veges in variety, and produce for the stall. And monetary gifts to Lepers, Homes and others. One wouldn’t think that last year’s dress would help to “Save a Child”. To remember on occasion, some little gift to send. And extra busy members receive a box of cakes. In needlecraft and baking and floral decoration. Our clothes are very arty – for “shipwrecks’ we wear less. For Santa comes to girls and boys on sledge or dapple grey. 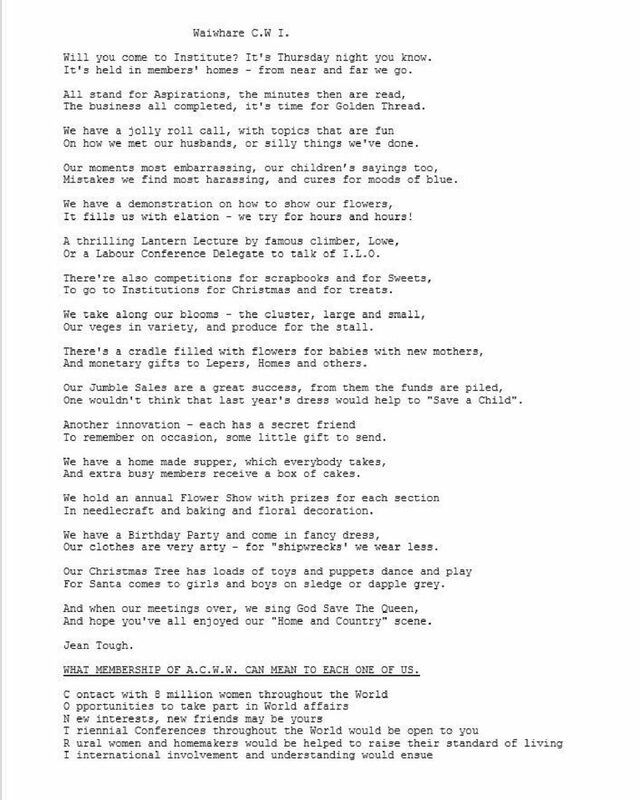 And hope you’ve all enjoyed our “Home and Country” scene. 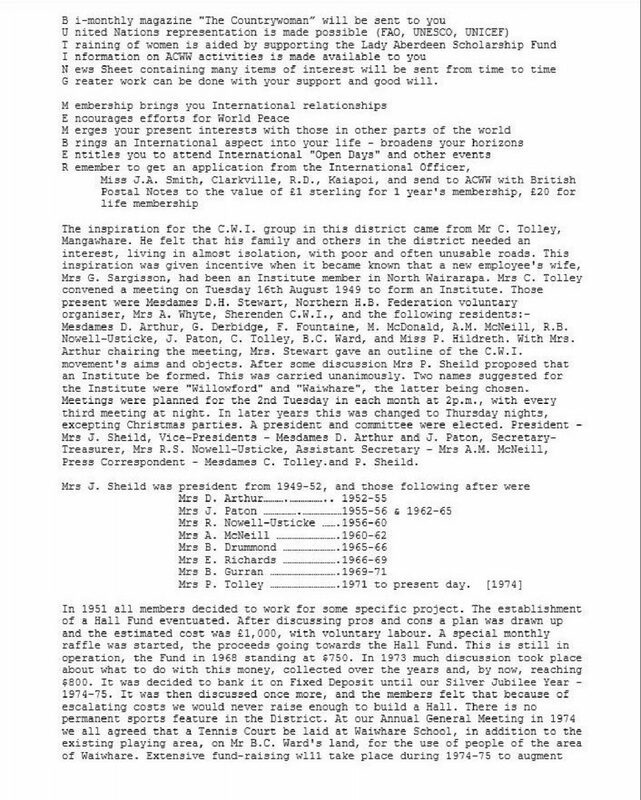 WHAT MEMBERSHIP OF A.C.W.W. CAN MEAN TO EACH ONE OF US. G reater work can be done with your support and good will. The inspiration for the C.W.I. group in this district came from Mr C. Tolley, Mangawhare. He felt that his family and others in the district needed an interest, living in almost isolation, with poor and often unusable roads. This inspiration was given incentive when it became known that a new employee’s wife, Mrs G. Sargisson, had been an Institute member in North Wairarapa. Mrs C. Tolley convened a meeting on Tuesday 16th August 1949 to form an Institute. Those present were Mesdames D.H. Stewart, Northern H.B. 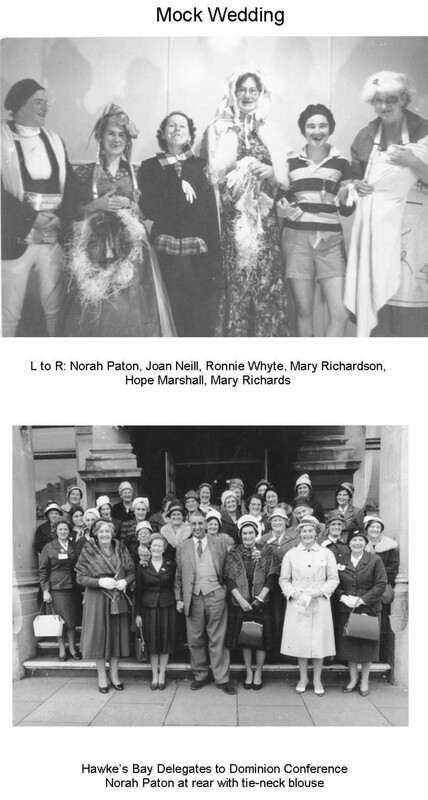 Federation voluntary organiser, Mrs A. Whyte, Sherenden C.W.I., and the following residents:- Mesdames D. Arthur, G. Derbidge, F. Fountaine, M. McDonald, A.M. McNeill, R.B. Nowell-Usticke, J. Paton, C. Tolley, B.C. Ward, and Miss P. Hildreth. 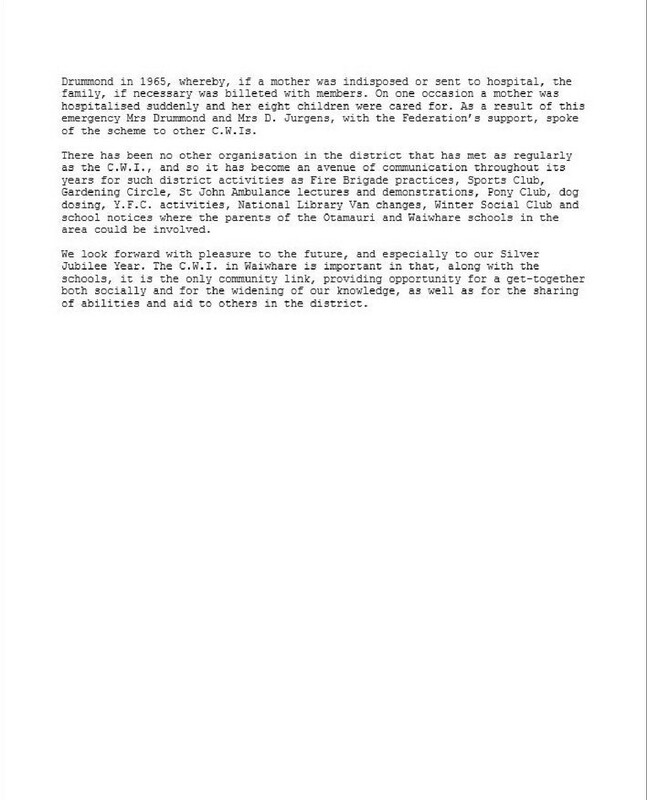 With Mrs. Arthur chairing the meeting, Mrs. Stewart gave an outline of the C.W.I. movement’s aims and objects. After some discussion Mrs P. Sheild proposed that an Institute be formed. This was carried unanimously. Two names suggested for the Institute were “Willowford” and “Waiwhare”, the latter being chosen. Meetings were planned for the 2nd Tuesday in each month at 2p.m., with every third meeting at night. In later years this was changed to Thursday nights, excepting Christmas parties. A president and committee were elected. President -Mrs J. Sheild, Vice-Presidents – Mesdames D. Arthur and J. Paton, Secretary-Treasurer, Mrs R.S. Nowell-Usticke, Assistant Secretary – Mrs A.M. McNeill, Press Correspondent – Mesdames C. Tolley and P. Sheild. the present Hall Fund. Voluntary Labour will be used for much of the construction work. Plans are also tentatively afoot to plant a group of “silver” trees (Silver Dollar Eucalypt, silver birch) near the Tennis Court to commemorate our 25 years Jubilee. Jumble Sales have been our main source of raising funds, enabling us to send delegates to Conference, give substantial donations to Dominion Federation and Northern H.B. Federation, and to a large number of worthy organisations. Not forgetting charity begins at home, our members have always readily come forward in times of tragedy, with material and financial assistance. Mrs D. Arthur, a foundation member, and second President, served on the Northern H.B. Federation from 1952-56, Co-ordinating Committee from 1959-64, and the Victoria Regional Co-ordinating Committee from 1959-64. While on Regional Committee Mrs. Arthur was hostess to Lady Burney, them[then] World Secretary of the ACWW. She escorted Lady Burney to visit the Mayor of Hastings, took her to lunch and attended a reception given by C.W.I. members in the afternoon. Mrs. Arthur was key member for H.B. for the Wool Board National Knitting Competition, and recalls having to cope with the posting of 200 parcels – all entries in the competition. She was in charge of the Wool Board Fashion Parade and showing of Gold Medal Award garments at Napier on the 10th and 11th March, 1964. Over 500 people attended the Parades each night. Later in 1963 she was invited to the Lower Hutt Town Hall where Wool Fashion Awards were presented by the Queen. In recognition of her valuable work Mrs. Arthur was awarded a Good Service Badge. Another member, Mrs B. Drummond, after completing a four year term as Treasurer was elected to the Northern H.B. Federation, serving one year as assistant Treasurer and three years as Treasurer. Her Institute felt she deserved a Gold Badge and recommended accordingly. This was declined, but she received a Good Service Badge in 1969. 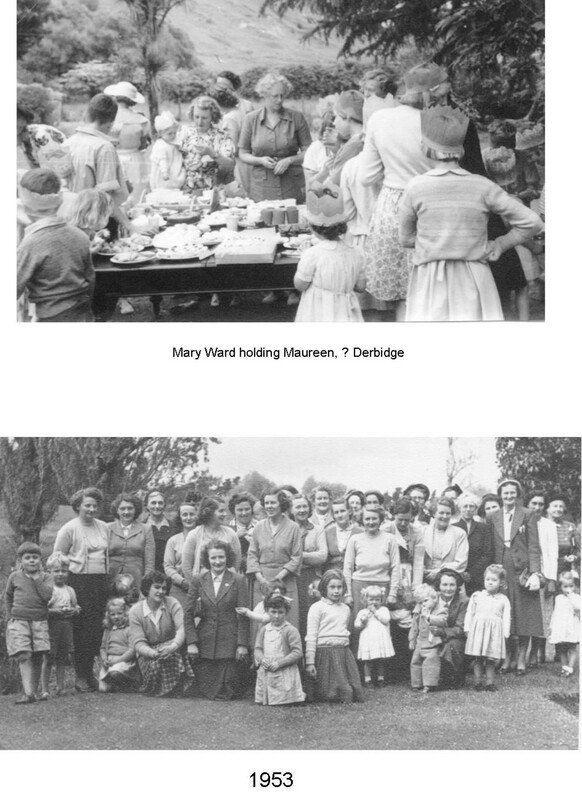 A Christmas Party held in 1950 at Glenross Homestead was a great success. Father Christmas distributed gifts to 45 children and a conjurer mystified young and old. The Christmas Party is a highlight of our year’s activities, the number of children rising to about 100 at times. Over the years Father Christmas has arrived by various means, not altogether without incident, some being pony, sledge, tractor, and even descending from a roof. In more recent times Father Christmas has arrived on the Kaweka Forest fire engine, flashing red light, siren and all, and in the open-air luxury of a vintage Daimler Convertible. The children take part in races, lolly scrambles and of course – afternoon tea, with much gusto. In 1973 they all came in fancy dress. It is amazing that so few mothers with similar interests can provide such a wide and exciting variety of costumes. Children’s Christmas parties are great fun for all, mothers and fathers included. one year proved to be a somewhat untimely prelude to collecting girls from the Napier Girls’ High School. The road is tricky even when one has not been wine-tasting. 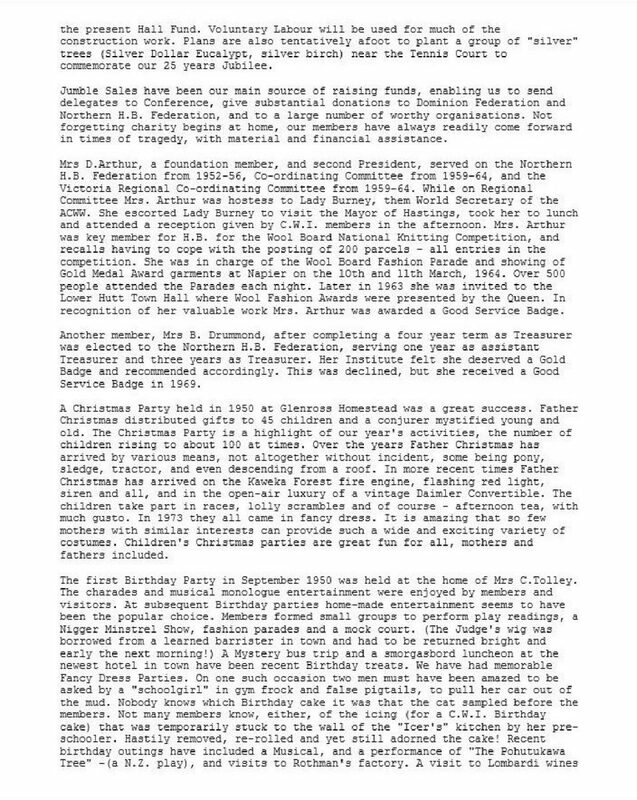 In October 1973 we held a most enjoyable 87th birthday party for our oldest member, Mrs M. Lowe. 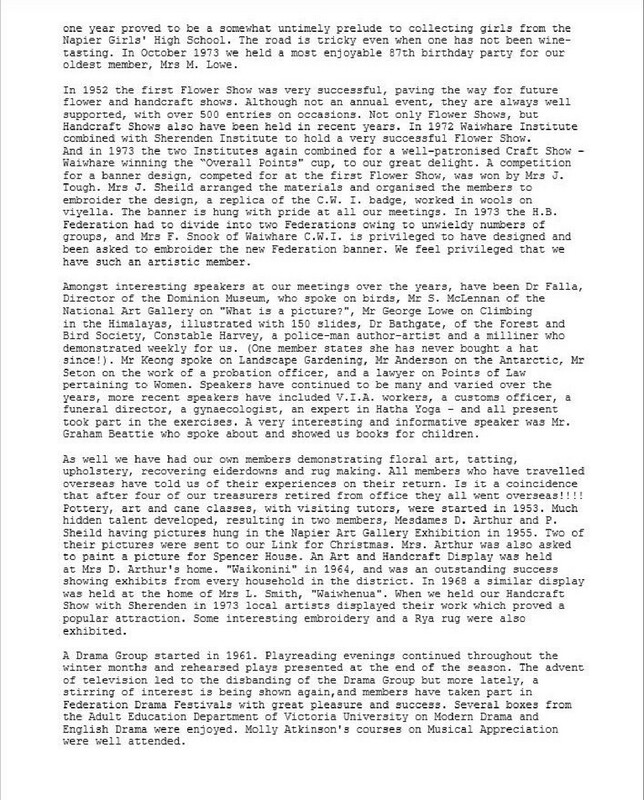 In 1952 the first Flower Show was very successful, paving the way for future flower and handcraft shows. Although not an annual event, they are always well supported, with over 500 entries on occasions. Not only Flower Shows, but Handcraft Shows also have been held in recent years. In 1972 Waiwhare Institute combined with Sherenden Institute to hold a very successful Flower Show. 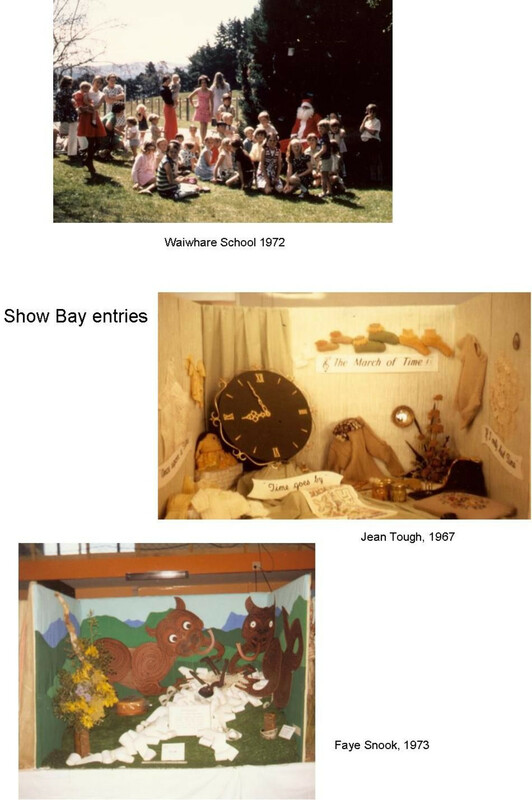 And in 1973 the two Institutes again combined for a well-patronised Craft Show – Waiwhare winning the “Overall Points” cup, to our great delight. A competition for a banner design, competed for at the first Flower Show, was won by Mrs J. Tough. Mrs J. Sheild arranged the materials and organised the members to embroider the design, a replica of the C.W. I. badge, worked in wools on viyella. The banner is hung with pride at all our meetings. In 1973 the H.B. Federation had to divide into two Federations owing to unwieldy numbers of groups, and Mrs F. Snook of Waiwhare C.W.I. is privileged to have designed and been asked to embroider the new Federation banner. We feel privileged that we have such an artistic member. Amongst interesting speakers at our meetings over the years, have been Dr Falla, Director of the Dominion Museum, who spoke on birds, Mr S. McLennan of the National Art Gallery on “What is a picture?”, Mr George Lowe on Climbing in the Himalayas, illustrated with 150 slides, Dr Bathgate, of the Forest and Bird Society, Constable Harvey, a police-man author-artist and a milliner who demonstrated weekly for us. (One member states she has never bought a hat since!). Mr Keong spoke on Landscape Gardening, Mr Anderson on the Antarctic, Mr Seton on the work of a probation officer, and a lawyer on Points of Law pertaining to Women. Speakers have continued to be many and varied over the years, more recent speakers have included V.I.A. workers, a customs officer, a funeral director, a gynaecologist, an expert in Hatha Yoga – and all present took part in the exercises. A very interesting and informative speaker was Mr. Graham Beattie who spoke about and showed us books for children. As well we have had our own members demonstrating floral art, tatting, upholstery, recovering eiderdowns and rug making. All members who have travelled overseas have told us of their experiences on their return. Is it a coincidence that after four of our treasurers retired from office they all went overseas!!!! Pottery, art and cane classes, with visiting tutors, were started in 1953. Much hidden talent developed, resulting in two members, Mesdames D. Arthur and P. Sheild having pictures hung in the Napier Art Gallery Exhibition in 1955. Two of their pictures were sent to our Link for Christmas. Mrs. Arthur was also asked to paint a picture for Spencer House. An Art and Handcraft Display was held at Mrs D. Arthur’s home. “Waikonini” in 1964, and was an outstanding success showing exhibits from every household in the district. 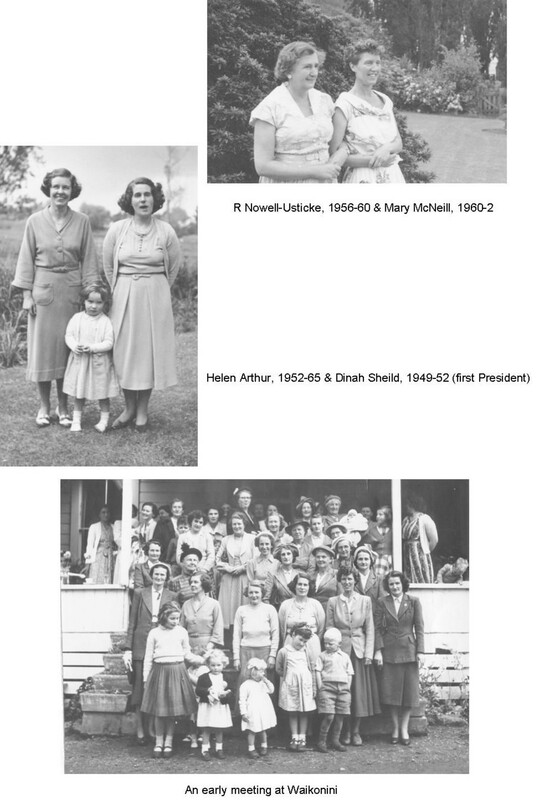 In 1968 a similar display was held at the home of Mrs L. Smith, “Waiwhenua”. When we held our Handcraft Show with Sherenden in 1973 local artists displayed their work which proved a popular attraction. Some interesting embroidery and a Rya rug were also exhibited. A Drama Group started in 1961. Playreading evenings continued throughout the winter months and rehearsed plays presented at the end of the season. The advent of television led to the disbanding of the Drama Group but more lately, a stirring of interest is being shown again, and members have taken part in Federation Drama Festivals with great pleasure and success. Several boxes from the Adult Education Department of Victoria University on Modern Drama and English Drama were enjoyed. Molly Atkinson’s courses on Musical Appreciation were well attended. A Garden Club operating throughout most of our years was brought into existence as a result of most of our C.W.I meetings being held in the evenings and members intense interest in seeing gardens. In recent years our Club has combined with Sherenden and so has evolved a wider interest. Our tours have included City Parks and Gardens, local and Palmerston North nurseries, as well as new and old established homesteads and gardens, and lectures from numerous garden specialists. A lecture by Mr Mather at an institute meeting was well-attended. He explained the methods of taking cuttings from fuchsias and dahlias and their care and cultivation. Members have shown interest and attended residential schools at Jerome Spencer House and Arahina [Arohaina], as well as the One and Two Day Schools held in local towns. Now that travel is not so difficult, members are more prepared to go into Hastings or Napier for One-Day schools. They have taken part in courses on the subjects of “Make-Up and Charm”, “Floral Art”, “Cooking for Teenagers”, and the making of ribbon roses. 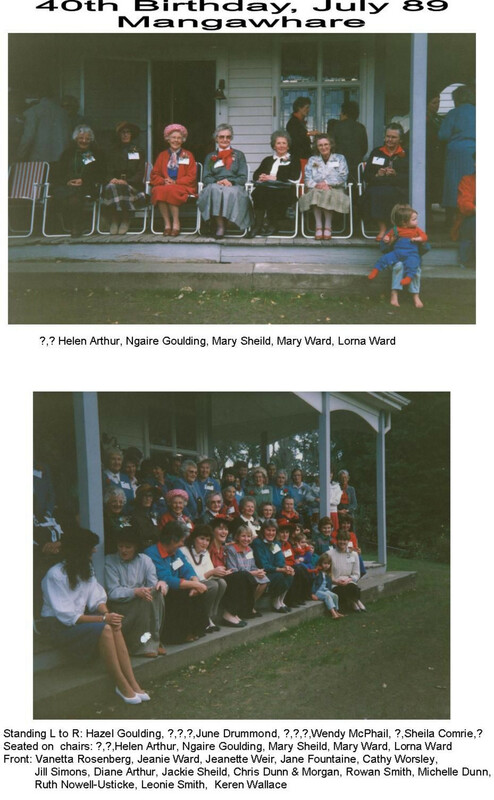 Our distance from City Libraries, the nearest being 30 miles away, stimulated interest amongst members in the formation of a Library at Mangawhare homestead. As a result the National Library Service van calls regularly to change books. A secret friend exchange in which members names and birthdates are drawn out of a hat, has been popular. The new friend receives a gift or card at Christmas or on her birthday, or some little kindness if ill. Although we do not now exchange secret friends, we do exchange attractively wrapped gifts at our December meeting. In the last few years we have had most enjoyable Christmas meetings, usually with a special theme – a Pizza party one year and a barbeque another year. We hope to combine all our Christmas activities in our Silver Jubilee Year and have a Sports Day for the Waiwhare district. In 1957 a “Save the Children” child, Gertrud Krishe of Hungary was adopted. Parcels were sent regularly and although not now sponsored we send her a card and handkerchief each Christmas. 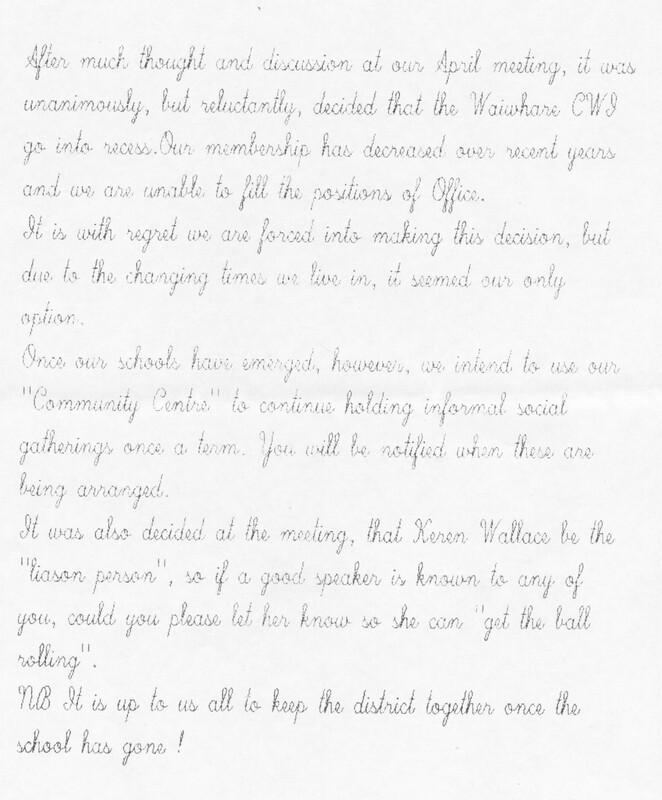 In 1953 contact was made with our Link Institute in Skenfrith in Monmouthshire and members take turns in writing letters to their members. Two of our members have visited this Link. (Mrs E. Low and Mrs D. Arthur). We were pleased to welcome Miss Hudson from Skenfrith who stayed in our district for several months, making her headquarters with Mrs R. Dampney. We compiled a scrapbook of our district for the Link and in return received a picture of Skenfrith village painted by a member’s husband. Our President has the pleasure of hanging this picture in her house during her term of office. A remit, proposed by Mrs T. Lamont, was forwarded to the Federation’s Annual Meeting in 1963, was: “That the H.B. Hospital Board be asked to give urgent consideration to the need of equipping the Board’s Ambulances with efficient analgesic drugs for the use of qualified St. John Ambulance officers in the case of country calls where the services of a doctor are not immediately available”. “There have been recent accidents where injured people could have been relieved of agonizing pain if provision had been made for a supply of pain relieving drugs to be part of Ambulance equipment”. Mrs Lamont was congratulated on her worthwhile remit which was subsequently carried and put into operation. We have also seconded a Remit for Federation Annual General Meeting proposed by Maraekakaho “That in order to prevent the breakdown in family life, parents sending their children to State Secondary School Hostels should have the choice of Full Board or Monday to Friday accommodation”. Promotion”, a notable achievement. Mrs B. Gurran, a President of our Institute, became a Group Convenor for the Kaweka Group. Our Federation was sorry to lose her when she moved to Patoka in the Northern Federation. In 1962 Mrs R. Dampney gained 3rd pace in the C.W.I. section of the National Knitting Contest. An excellent effort. We have entered the Show Bay competitions in the local annual A & P Shows twice. We were thrilled to take 5th place in 1973.
Who remembers the Annual Meeting when bouquets for the retiring officers were forgotten and flowers brought for the Sales Table were hastily wrapped and presented? Mrs. E. Richards presented the C.W.I. with a visitors book, which will prove most interesting in future years. Mrs. E Low gave us a bell in 1955 for use at meetings. It still rings well! Community work has been a feature of our C.W.I. Wool was spun and socks and gloves were knitted for Mr G. Lowe, a local school teacher who left for a climbing expedition in the Himalayas. Over the years we have knitted numerous peggy squares and made rugs, and had clothes drives for Child welfare distribution. Cartons of shoes are left at a closely settled rural area, and these always mysteriously disappear. 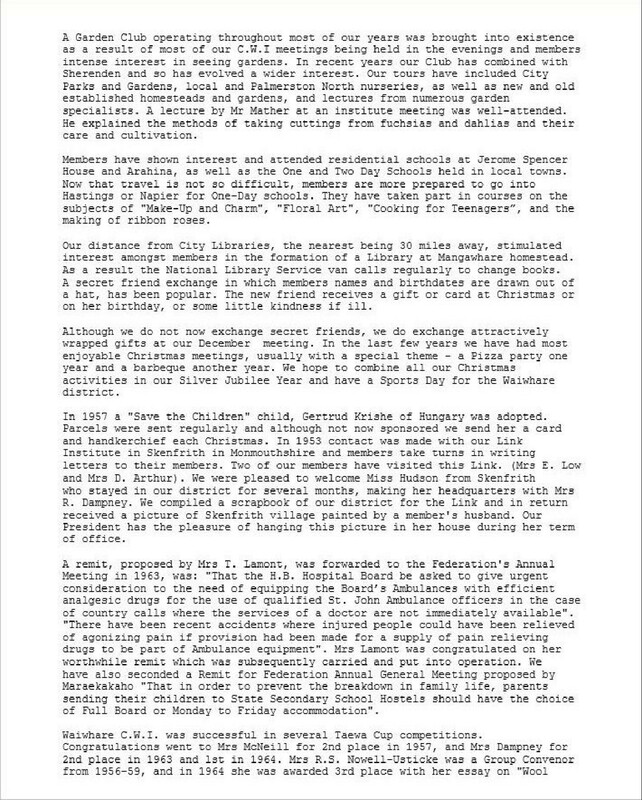 Members took children from the Welfare Home into their own homes for the 1960 Christmas period to enable those in charge to have a holiday. One member has recently had a visit from one of these children. At the instigation of the Waiwhare C.W.I. road signs were erected at either end of “Paton’s Mile” a stretch of the main road through several cuttings, where a definite hazard is caused by howling gusts of wind. After Mrs Drummond returned from a trip to Tonga in 1967 she organised the collecting and sending of used clothing for the needy in that island, books for the schools and patchwork quilts for the hospital there, a worthwhile task most appreciated by the recipients. In 1957 Mrs Paton with the full support of members, approached the Plunket Society with the result that a Plunket nurse attended Sherenden Hall once a month for the benefit of mothers in the district. This scheme is now no longer necessary as our District is now covered by the Hastings Public Health nurse. 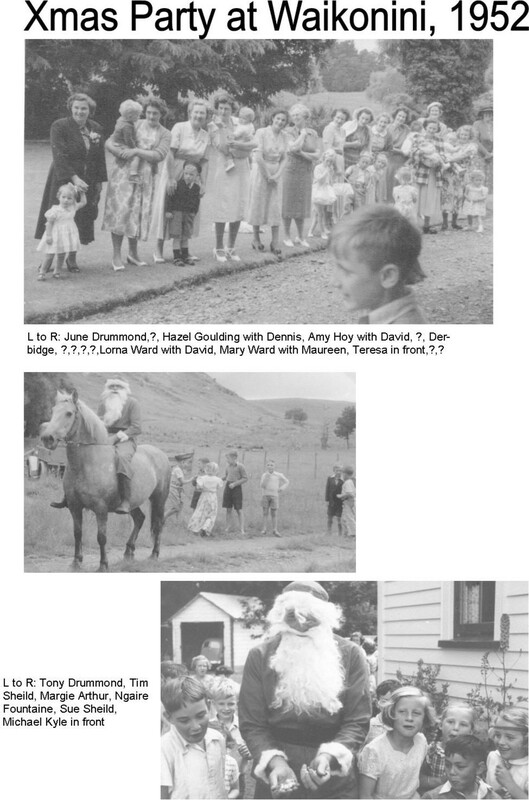 A firewood drive for old people in Hastings was held in 1961. That year also marked the commencement of our Christmas Hampers for the needy old people in Hastings. The distribution of Christmas Hampers continues – although they now go to needy families, the names of which are supplied by Birthright. Members are certainly generous and make sure that the hampers are full of Christmas goodies. It is a pleasure to deliver the parcels and see that it really is a useful activity to do at a busy time of the year. Many other organisations benefit from the work of our members – we donate substantial amounts of money to worthwhile organisations, among them the Leper Trust, The St John Ambulance Association, H.B. Art Gallery and Museum, Intellectually Handicapped Children’s Society, Red Cross and the Tonga Hospital. We have also donated material goods to some of these very worthy causes. Not only are our members active within their Institute, they are also very willing to help with Federation projects. Mrs B. Gurran and Mrs F. Snook spent a week constructing and painting a 9′ x 6’ replica of the C.W.I. badge for the Federation arch used in the street decorations for the 1973 Hastings Blossom Festival. Drummond in 1965, whereby, if a mother was indisposed or sent to hospital, the family, if necessary was billeted with members. On one occasion a mother was hospitalised suddenly and her eight children were cared for. 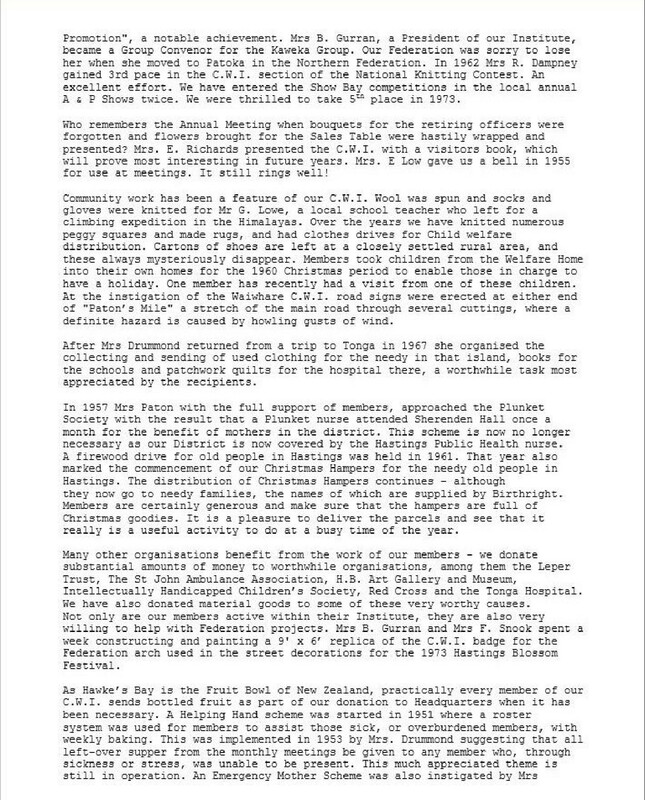 As a result of this emergency Mrs Drummond and Mrs D. Jurgens, with the Federation’s support, spoke of the scheme to other C.W.Is. 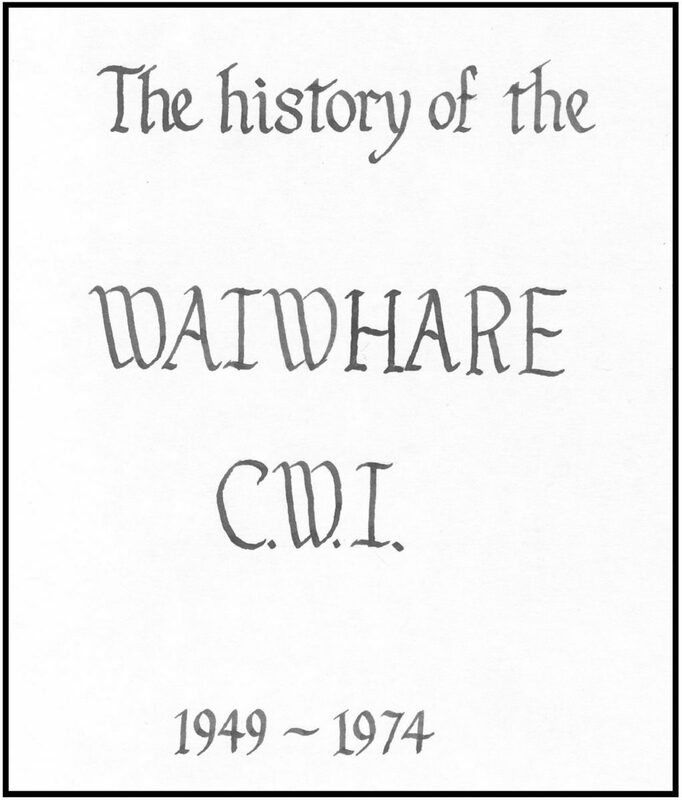 There has been no other organisation in the district that has met as regularly as the C.W.I., and so it has become an avenue of communication throughout its years for such district activities as Fire Brigade practices, Sports Club, Gardening Circle, St John Ambulance lectures and demonstrations, Pony Club, dog dosing, Y.F.C. activities, National Library Van changes, Winter Social Club and school notices where the parents of the Otamauri and Waiwhare schools in the area could be involved. We look forward with pleasure to the future, and especially to our Silver Jubilee Year. The C.W.I. in Waiwhare is important in that, along with the schools, it is the only community link, providing opportunity for a get-together both socially and for the widening of our knowledge, as well as for the sharing of abilities and aid to others in the district. 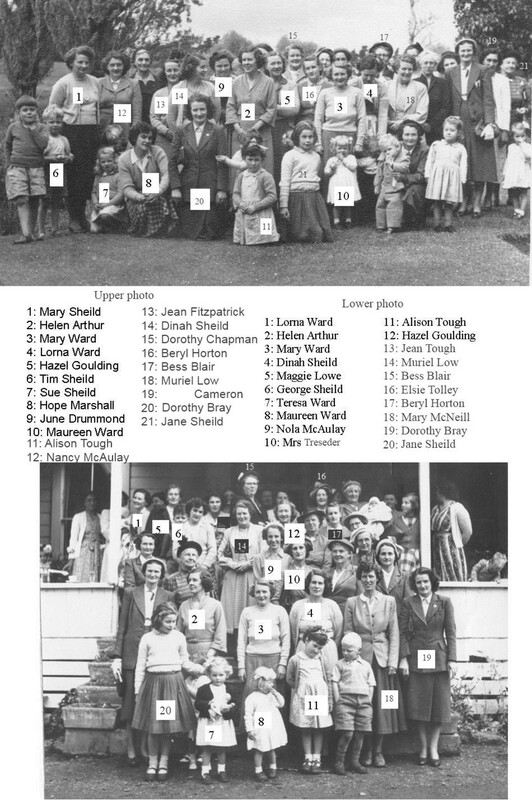 L to R: June Drummond, ?, Hazel Goulding with Dennis, Amy Hoy with David, ?, [Margaret] Derbidge, ?, ?, ?, ?, Lorna Ward with David, Mary Ward with Maureen, Teresa in front, ?, ? Standing L to R: Hazel Goulding, ?, ?, ?, June Drummond, ?, ?, ?, Wendy McPhail, ?, Sheila Comrie, ? After much thought and discussion at our April meeting, it was unanimously, but reluctantly, decided that the Waiwhare CWI go into recess. Our membership has decreased over recent years and we are unable to fill the positions of Office. It is with regret we are forced into making this decision, but due to the changing times we live in, it seemed our only option. Once our schools have emerged [merged], however, we intend to use our “Community Centre” to continue holding informal social gatherings once a term. You will be notified when these are being arranged. It was also decided at the meeting, that Keren Wallace be the “liason person”, so if a good speaker is known to any of you, could you please let her know so she can “get the ball rolling”. NB It is up to us all to keep the district together once the school has gone!